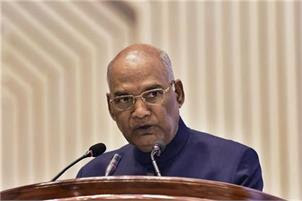 President Ram Nath Kovind has said the Indian economy is set for a surge with the GDP size seen at doubling to USD 5 trillion probably by 2025. He was speaking after launching the platinum jubilee celebrations of chartered accountants' apex body ICAI. "Indian economy is set for a surge and in the next decade, probably even by 2025, India is expected to double the size of the GDP to USD 5 trillion," Kovind said. Emphasising that adherence to fair taxation system is much more than merely providing revenue to the government, Kovind said chartered accountants are the watchdogs of public trust. Chartered accountants have a key role to play and are facilitators of tax payers as well as taxation system. Minister of State for Corporate Affairs P P Chaudhary said the government's fight against black money is continuing and that around 2.25 lakh suspected shell companies have been identified. These entities are being analysed and suitable action would be taken, he added. ICAI President Naveen N D Gupta said the world congress of accountants would be held in India in 2022. Minister of State for Communications Manoj Sinha also spoke at the function. The Institute of Chartered Accountants of India (ICAI) has more than 2.80 lakh members.